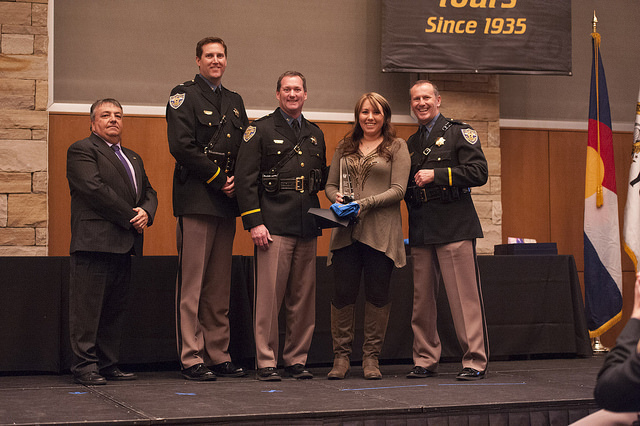 On April 7, 2017, the Colorado State Patrol family gathered at the Colorado State Patrol Annual Awards Ceremony to recognize excellence in service and celebrate acts of heroism, selflessness and life-saving. The event recognized members from all areas of the Patrol, across all of Colorado: Troopers, port of entry, communications, civilian members and supervisors. Chief Scott Hernandez and CSP leaders bestowed Distinguished Service Awards, Lifesaving Awards, and the Purple Heart before presenting awards at the Troop and District levels. The ceremony concluded with awards for Civilian, Port of Entry Officer, Communications Officer, Supervisor and Trooper of the Year. You can view the full list of honorees in the Awards Ceremony Program. Read on for bios of the top award winners. Group photo of the 2017 award winners and command staff. Bestowed upon an employee for an act of heroism calling for an outstanding degree of dedication that is above and beyond professional duty and may include the protection of life or intervention under instances of personal risk. This award is given for an act or series of acts committed with outstanding courage in a situation that, because of its extraordinary circumstances, placed the member and/or others in actual physical jeopardy. While exposed to danger, the member must have acted with deliberate intent and while acting must have exercised judgment and performed competent action sufficient to reflect admiration upon themselves and the State Patrol. Bestowed upon a member for saving or preserving a human life, and such action was beyond the scope of regular daily professional law enforcement. The Purple Heart award is for a member who has been seriously injured, wounded, or killed by acts of aggression or assault upon them while performing basic law enforcement functions of protection of life or property, enforcement of laws, preservation of the public peace, prevention of criminal acts, or apprehension of criminals. Over the past year, Mr. Leary has brought about significant positive changes to the CSP Academy Food Service program. By utilizing his talent and passing on his knowledge, he has transformed the quality of food from that of a school cafeteria to that of a good family restaurant. In doing so, he has not only improved the quality of the food served to patrons of the Academy, but has also given offenders working in the cafeteria meaningful real-world skills -- skills they can use their release to earn gainful employment, thus lessening the likelihood of recidivism. Mr. Leary continues to complete top-to-bottom assessments of the food program, adjusting when ingredients are used and purchased, in order to save the State Patrol thousands of dollars in food production costs while also improving food quality and nutritional value. 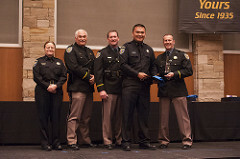 Officer Suleimenov has overcome adversities to become one of the Colorado State Patrol’s most valued members. Suleimenov began his CSP career in 2014. He has earned Level 1 safety inspector certification and has completed training in hazardous materials, cargo tank and bulk packaging transport. Throughout 2016, Officer Suleimenov led his port in the number of safety inspections completed and is ranked second for the Motor Carrier Services Branch with a total of 466 safety inspections. In May and August 2016, he contacted drivers under the influence of drugs or alcohol, resulting in the drivers' arrests. He is meticulous when performing his duties and continually challenges himself and the other officers in the port to ensure proper enforcement actions are taken. Most important is the extra effort he puts forth to educate drivers; when performing safety inspections, he is patient with drivers, taking the time to explain violations and what measures drivers need to take to gain compliance. Officer Suleimenov is fluent in five languages and has served as a translator throughout the Colorado State Patrol. He is always willing to help his fellow officers and the management team in any way that he can, such as trading shifts, sharing his computer knowledge, and volunteering for extra duties. Suleimenov is also innovative: he developed a method to track traffic patterns and updates this helpful data on a monthly basis. Ms. Laut has become an expert in handling difficult Safe2Tell calls. In 2016, she received four separate written commendations for her efforts in assisting school children. She has a knack for gaining the information necessary to help kids through text messages. She is able to establish a rapport with these anonymous callers and gain their trust. These skills enable her to provide assistance to children who feel threatened, afraid or in danger. While we may not be able to keep tally on the lives she’s saved, she serves as the life-line to not only those seeking emergency services, but also first responders. 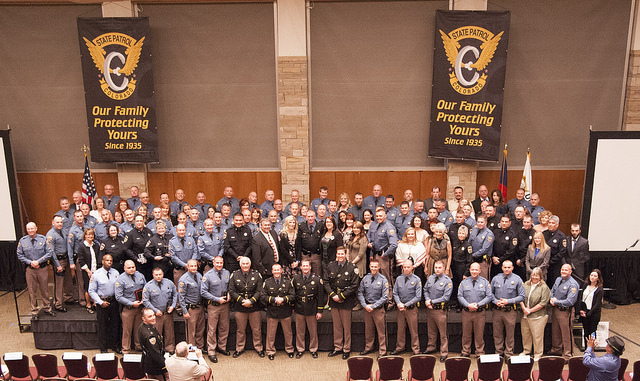 On November 15, 2015, tragedy struck Troop 1C and the Colorado State Patrol Family. That day we suffered the loss of one of our own, Trooper Jaimie Jursevics. 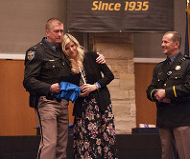 Captain Jeff Goodwin pushed forward through his own deep sorrow and sadness, and supported both his troopers and the Jursevics family as they began the grieving process. Over the course of the next 12 months he never faltered and never stopped giving of himself to the Jursevics family, the troop and the agency. He strived to find ways to help those in need through friendly conversations, arranging counseling opportunities and creating a safe environment for people to be heard. He maintained a positive outlook and dedication to not only the mission but more importantly the members of the agency. Again, on November 25, 2016, tragedy struck Troop 1C and the Colorado State Patrol Family when Trooper Cody Donahue was struck and killed in the line of duty. This opened a mending wound for the agency and especially for Troop 1C, District 1. Capt. Goodwin once again provided support and console not only to the Donahue family, but also the Jursevics family and a troop office full of their friends and colleagues. Capt. Goodwin continues to spend countless hours making himself available to the families, the troopers and the public who so dearly wanted to pay their respects. He organizes and supports opportunities for the Troop to grieve and spends time with Cody’s family, all while fulfilling his duties as a Troop Commander. It has been said that in calm water every ship has a great Captain, however the true test of a great Captain is how they command during horrific storms. Captain Goodwin faced the most terrible circumstances a commanding officer can face and has done so twice. His leadership and humanity shines during this time and is an extraordinary example as he lives the motto of "Our Family Protecting Yours." 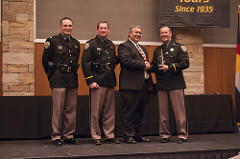 Trooper Matthew Bowman’s dedication to impaired driving enforcement is second to none. He became a Drug Recognition Expert with less than two years of service and has utilized those skills and knowledge to reduce the impact of impaired driving in the San Luis Valley. Last year he arrested 47 drivers who were under the influence of either drugs or alcohol prior to them having the chance to injure or kill someone in a crash. Trooper Bowman also filed more drug charges than any other troop in the state. Trooper Bowman knows the value of partnerships; on numerous occasions, he has aided law enforcement agencies in the San Luis Valley by sharing his knowledge of impaired driving detection. He has responded to assist fellow law enforcement officers in their efforts to remove drunk and/or drugged drivers from our state's roads. Trooper Bowman has been heavily involved a new program for juvenile offenders that aims to keep them from becoming repeat offenders. 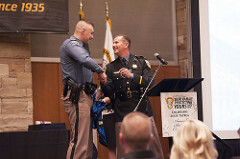 Trooper Bowman has received praise for his ability to make connections with the juvenile offenders during the program's sessions.